Hemsec SIPs offer fast track, lightweight building solutions for all sectors of the construction industry and building types. Offers a cost effective approach; are quick and easy to use, minimizes waste and labour. Manufactured from environmentally friendly materials using high-pressure foam injection which create incredibly strong structural insulated panels. Designed for all internal and external wall and roof buildings in domestic and non-domestic applications such as houses, offices, commercial buildings, leisure facilities, schools, hospitals and hotels with their composite construction ensuring excellent structural load bearing, superior insulation and eliminating problems such as thermal bridging and compression shrinkage. Exceeds the requirements of the Building Regulations and saves energy throughout the life of the product. The Hemsec SIPS building system has been extensively tested by CERAM (UKAS approved) with a wide range of test reports available from Hemsec. Standard blank panel: 1200 mm. BASF polyurethane PUR core: Closed cell insulation core with a Zero Ozone Depletion Potential (ODP), CFC and HCFC free. Orientated strand board (OSB): Grade 3 BBA approved board, manufactured to BS EN 300, load bearing oriented strand boards for use in humid conditions. Standard external and internal sheet thickness: 15 mm. (Alternative facings can be researched on request). 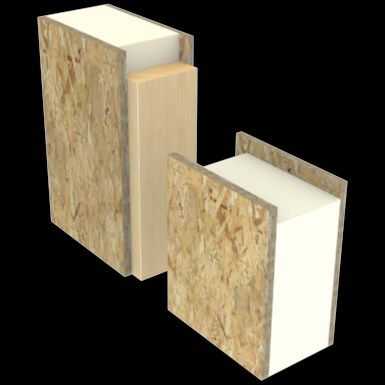 Panel internal and external OSB and CPB facings have Class 1 surface spread of flame to BS 476–7 and are Class 0, as defined by Building Regulations. The panels achieve up to 75 minutes fire rating to BS 476–21 for load bearing walls and 90 minute fire rating for non-load bearing to BS 476–22. OSB faced panel plus 12.5 mm plasterboard to each face achieves a weighted sound reduction index (SRI): 40 dB (DnT, w+C, Ctr). OSB faced panel plus 12.5 mm sound block and one face with 12.5 mm plasterboard, achieves a weighted sound reduction index (SRI): 46 dB. Varies depending on type of panel, consult BBA for full loading information. Standard spline joints achieve low air leakage and thermal performance. Six standard sizes available. Cut lengths to suit between 500–6000 mm also available. The product information below is from the NBS Plus library of product clauses offered in NBS specification products. It has been created by NBS for Hemsec Panel Technologies (HPT). Each product clause is authored in NBS format and is intended for inclusion in project specifications. Please note that NBS product guidance is not a replacement for the manufacturer's literature and it is recommended that Hemsec Panel Technologies (HPT) be consulted before specifying.